We stock a wide range of quality, low maintenance security fencing products for all your requirements. We offer free site surveys and quotations for our professional fitting service. 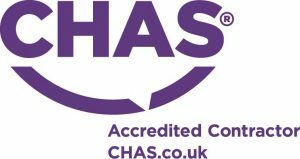 We are members of Constructionline and are CHAS accredited contractors, ensuring our commitment to the highest standards of Health & Safety. Please Contact Us for more details or to arrange a site survey. Strong and durable security fencing providing excellent protection against climbing and intrusion. Available in a selection of heights and colours. We can supply only or supply and install. Prices available on request. Standard gates are available or tailor-made to suit your requirements. All gates are supplied with rear hung adjustable hinges, pad-lockable drop-bolts, multi-holed to suit site conditions complete with anti-climb PROTECTORGATE slide latch. Sports bronze has been developed to provide a cost effective solution for most general sporting applications, excellent for use in schools, urban sports grounds, health clubs and ball containment areas. The VGUARD system is suitable for most applications where general site demarcation is required, typical examples are uses in schools, public areas, commercial businesses and retail outlets. Vertical bar railings are aesthetically pleasing and built to last and can be complemented with a range of forged-heads and finials which are available as an option to achieve a more decorative look. Verticals can be in any height up to 2.4m and produced from solid bar, round or square, square-to-view or diamond-to-view with either blunt, domed or pointed tops. Standard gates are available to tailor-made to suit your requirements. All gates are supplied with side hung adjustable hinges, pad-lockable drop-bolts, multi-holed to suit site conditions and robust pad-lockable slide latches. Bow top railing systems are available in a variety of styles: single, interlaced, bow in bow, bar in bow and bow and bar. Standard gates are available or tailor-made to suit your requirements. All gates are supplied with adjustable hinges, pad lockable drop-bolts, multi-holed to suit site conditions and robust pad-lockable slide latches.